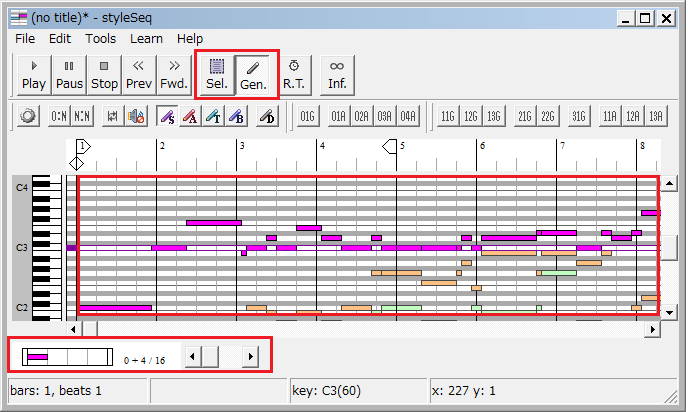 'styleSeq' is a freeware that provides harmonics to given melodies, and also provides melodies and drum patterns from scratch. The characteristic feature is the AI technology(especially artificial neural network). You can make it learn your favorite MIDI files, and it responds by making new melodies. Push the "01G" button. Then the melody will be generated by AI on piano roll. Next, push the "11G" button to generate a counter line. 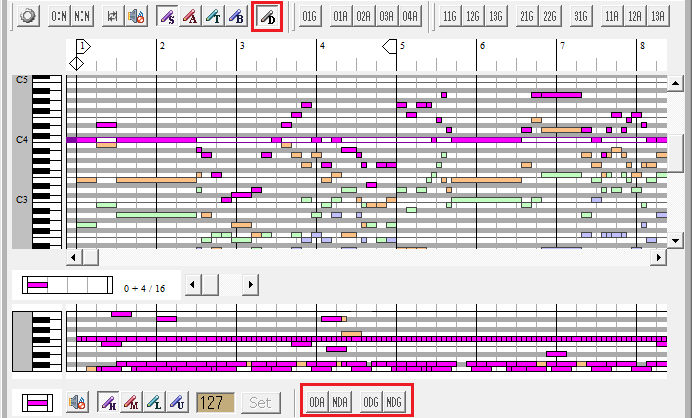 You can generate the melodies and counter lines in this way. The "11A", "12A" and "13A" buttons provide contrapuntal melodies. The function of each button is as follows. 01G AI provides a melody from scratch. 11G～31G AI provides counter lines. 11A～13A Provides contrapuntal counter lines for a given melody. 0DA～NDA Randomly add existing drum patterns of the specified length. "NDA button" adds with the same length as the melody. 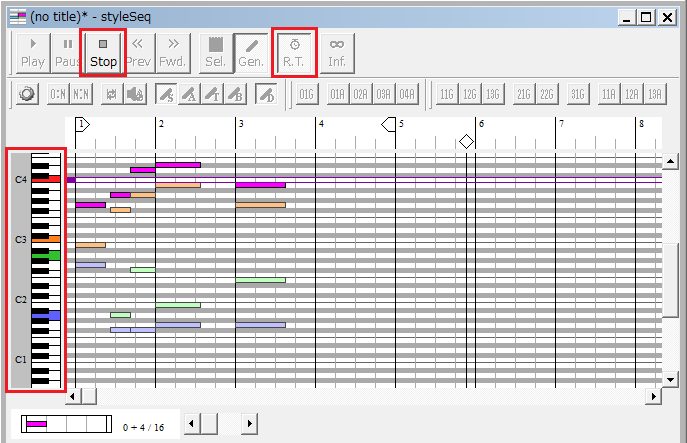 0DG～NDG Generate a drum pattern of the specified length using AI. "NDG button" generates corresponding to the melody. Of course, you can also input and edit melodies from piano roll canvas. You can input notes by double-clicking piano roll canvas. The length of the note is changed in the bottom of the window scroll bar. If you want to delete the note, right double -click on the note. You can select multiple notes by dragging the piano roll canvas above when the "Sel." button is pressed. For the selected notes, you can delete by pressing the Delete key and can move by dragging. From "R. T." button, you can switch to improvisation generation mode. In this mode, you can perform, harmonize, and record in real time by clicking the keyboard screen or pressing the corresponding key. To end the improvisation generation mode, press the "Stop" button. From the "Inf." Button, you can switch to the infinite generation mode. In this mode, it continues to generate melody indefinitely until you press the "Stop" button. 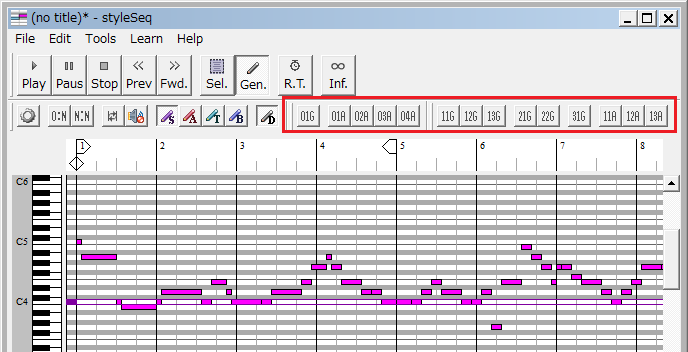 You can select whether to output MIDI files. It is an executable file and related files only to download / delete. Copyright (c) 2018, Yasutaka Motoyama. Any bug report, suggestion and recommendations are welcome below.